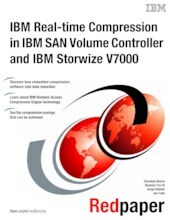 IBM® Real-time Compression™ software that is embedded in IBM SAN Volume Controller (SVC) and IBM Storwize® V7000 solution addresses all the requirements of primary storage data reduction, including performance, by using a purpose-built technology called . This IBM Redpaper™ publication addresses the key requirements for primary storage data reduction and gives real world examples of savings that can be made by using compression. SVC and Storwize V7000 is designed to improve storage efficiency by compressing data by as much as 80% through supported real-time compression for block storage. This process enables up to five times as much data to be stored in the same physical disk space. Unlike other approaches to compression, IBM Real-time Compression is used with active primary data, such as production databases and email systems. This configuration dramatically expands the range of candidate data that can benefit from compression. As its name implies, IBM Real-time Compression operates as data is written to disk, avoiding the need to store data that is awaiting compression.